From Shimla drive to Sarahan (1,920m/ 174-km). Overnight stay at the hotel. 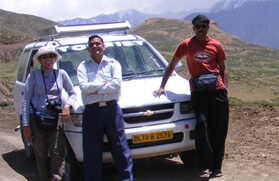 Drive from Sarahan to Chitkul (3,450m/122-km). Overnight stay at the trekking campsite in Chitkul. Trek through lush green meadows to the grazing fields of Nagasti on the banks of the Baspa River, after lunch on the riverbank return to the campsite in Chitkul for overnight stay. After breakfast drive to Kalpa (2,900m/ 80-km) en route visiting Recong Peo, the new Buddhist monastery built to commemorate His Holiness Dalai Lama's Kalchakra sermon and the ancient village of Pangi, lunch will be served en route. After tea at trekking camp in Kalpa walk to Chinni village. These villages offer a good opportunity to observe the lifestyle of the inhabitants. Return to the camp for overnight stay. 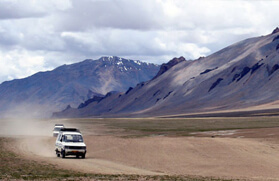 The barren and rugged brown mountains start from Pub (2,837m), one can continue along the Sutlej till one reaches Khab (2,831m) the meeting point (Sangam) of rivers Sutlej and Spiti. A direct climb up takes one to the temple of Padmasambhava the second incarnation of Lord Buddha. Camp overnight. 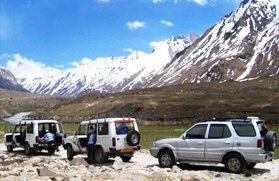 Drive inside Spiti valley. 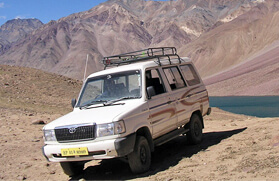 Geologically and archaeologically, Spiti is a living museum. 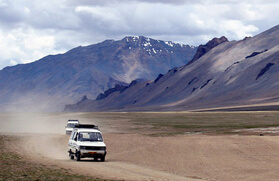 These barren rock mountains are devoid of any vegetation due to erosion by wind, sun and snow over thousands of years. The rugged and rocky mountain slopes sweep down to the riverbed giving the landscape a moon like appearance. Climb up to Tabo (3,050m/64-km), he largest monastery in Spiti and one of the few remaining examples of golden period of Buddhist culture in the Himalayan region. Camp overnight. 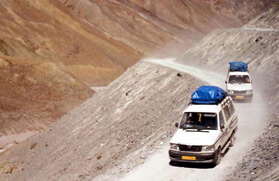 Drive to Dankar (also spelt as Dhankar) the traditional capital of Spiti, Dankar Gompa (3,890m) is located on top of a hill 25m. From Tabo, a further 22-km. takes one to Kaza. Camp overnight. Visit the famous Ki Gompa and onward to the second highest inhabited village in the world Kibber. 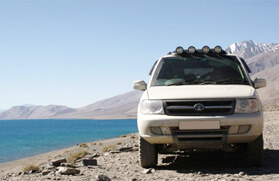 Return to Kaza and camp overnight. 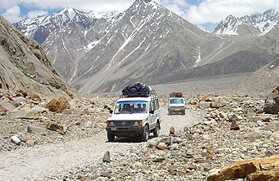 Drive to Chhatru (3,560m/160-km), over the famous Kunzum pass (4,551m). Camp overnight. 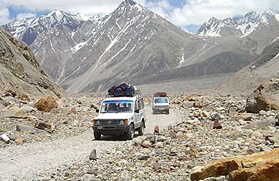 Drive from Chatru to Keylong (3,350m/104-km). Camp overnight. 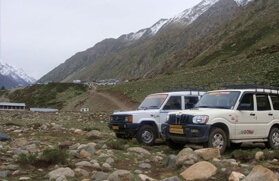 Visit the famous Khardong Gompa then drive through the Rohtang pass (3,980m) to Manali (2,050m/ 115-km). Overnight stay at a hotel. 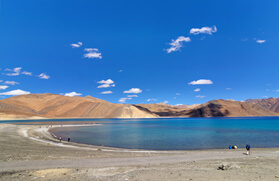 Explore the picturesque valley of Manali. Overnight stay at a Hotel. Drive via Kullu to Shoja (2,745m/122-km) a beautiful village on the edge of the Great Himalayan National Park. Overnight at the camp. Early morning trek along the road to Jalori Pass (3,135m/4-km). After lunch at the pass return to camp for overnight stay. Drive to Mandi (475m/70-km) and onwards to Palampur (1,219m/94-km), which is set admist lush green tea gardens. Overnight stay at a hotel. 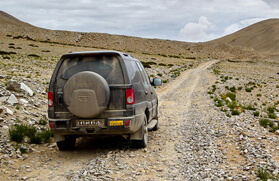 Drive to Dharmshala (1,980m/58-km) the seat of His Holiness Dalai Lama in exile. Overnight stay at the hotel. 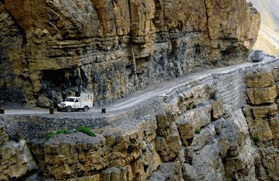 Drive to Dalhousie (2,036m/164-km) set within the Dhauladhars and overlooking the Pir Panjal Range. Dalhousie has retained much of its original character and thick forested hills. Overnight stay at a hotel. Full day excursion to the meadows of Khajjiar. Overnight stay at a hotel. Drive to Amritsar (213-km). Overnight stay at a hotel. Visit the famous Golden Temple. Afternoon at leisure. Overnight stay at a hotel. Connect train Shatabdi Express to Delhi.